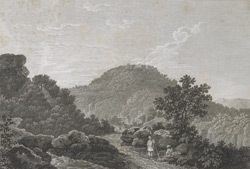 Engraving of a view of Bidjegur by Benjamin Thomas Pouncy (d. 1799) after William Hodges (1744-1797). Plate 10 of William Hodges 'Travels in India, during the years 1780, 1781, 1782, & 1783' published in London in 1793. In 1781 Hodges was sent by his patron, Warren Hastings, to witness the siege of Bijaigarh by Major Popham. Hodges made sketches while he was there. At this time, Indian rebel Raja Chait Singh had wrested control of the fort from the British. Popham's siege was a success, although Chait Singh managed to escape to Gwalior.